Use .820 Flow Control Valve to adjust or stop the flow of water through 3/4" drip poly tubing (.820" OD) and or .820 soaker hose. Use them in the garden to isolate, regulate different runs to your vegetables. Compression fittings require no glue. 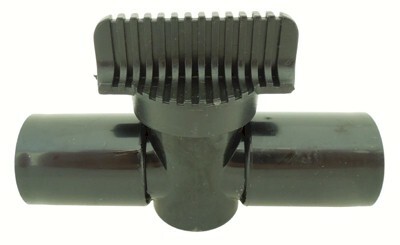 Compression end (black ring stamped 800) accepts .820-.830 OD drip tubing, soaker hose.